This is a story of a loving father interested in the future of his son. He is mindful, even in his old age about his son. He sent his servant to a far away land in order to find a bride for his son. Abraham has a lonely walk with God. He had no one to encourage, admonish etc. no church, no accountability, no life groups. All he had was the spirit of God, instructing and counseling him. He had an apostolic heart- to reach out to the nations of the world. Q. what is the apostolic ministry? Christianity is about son ship. We were far from God and He brought us near to him. This ministry is about fathering and being fathered. Abraham takes risks to unlock the true potential of Isaac. They lived in Canaan, a pagan idolatrous place. But he did not compromise. The apostolic gift comes to unlock people so that they reach their full potential. Its about looking after their sons and daughters. In this context, it must be said, that daughters are also very important in the purposes of God. 2. It’s about relationships. Christianity is all about relationships. Our relationship with God and our relationship with one another. Jesus came to restore our relationship with God- to break the wall of hostility between us and God. When Abraham said to his servant to find a suitable bride for his son, he trusted his choice. This man (Eleazor) was his servant for 65 years. The only condition he placed was that she should be a part of the promise. Abraham is saying, I value you as a gift from God and I value the gift God has given you. This servant was the one person who could have jeopardized God’s plan. This shows the trust he had upon him. When we go through difficult times, we do not want to trust anyone anymore. But remember that Jesus trusts you. He trusts you with His bride. The Bible says that one of the phenomenons in the last days is that the love of many will grow cold. Do not let this be. Trust! Invest in relationships. The apostolic message is- love one another. If you put the law and prophets together- the message is to love one another. It’s not a difficult thing to do. Pay attention to your family and your relationships. Children count. Let’s pay a big premium for that. Abraham recognized people’s gifts and released them. They became an army. 4. Mission: Abraham was not going to settle because he was sure that his mission will be successful. When God sent Jesus, he knew he will find His bride. And here we are- a part of the glorious bride of Christ. He says, “you will be successful”. We are here to find a bride for God’s son. 5. The big picture- Abraham reminded himself about the vision. Look back at the faithfulness of God in your life and know that His promises will be fulfilled. In verse 24-27- the servant bowed down and worshipped. The big picture is that we belong to a God of faithfulness. He’s given amazing promises and Abraham was holding on to those promises. Lot and Abraham lived in the same time, but we see how they responded to God’s promises, how they treat their children and the legacy they leave behind. Let’s believe in the promises of God. All over the world people celebrate Easter and all kinds of traditions surrounding it. But let us remind ourselves of what Easter is really about. 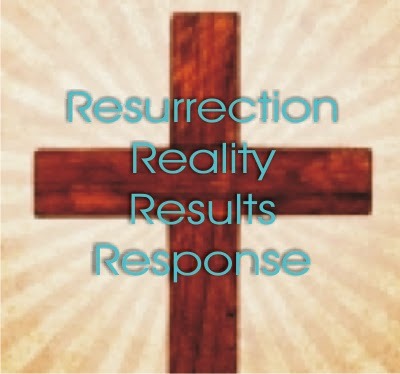 We will look at 3 things- Reality, Results and Response to the resurrection of Jesus Christ. 1. Reality of the resurrection: Acts 2:22-36- Peter is addressing a large crowd. This was on the day of Pentecost and the Holy Spirit came upon them and they went out on the streets praising God- and the other people heard their own languages. In verse 13, some thought they were drunk. At this point Peter preached and explained. Jesus is a person rooted in history- a real person in real time. He came from Nazareth. The miracles led to wonder. These miracles were a sign pointing to the reality of who Jesus is. What happened to Jesus was prophesied earlier in scripture. Every religious leader died and decayed. They had no power over death. But not so with Jesus- the grave could not hold Him. He was a person of history but not a victim of history. That was a part of the eternal plan to die and be raised from the dead. Peter puts the responsibility on his hearers- that they put him to death. The Old and New Testament speaks of the resurrection- the resurrection is what Christianity rises and falls upon. It’s the hinge. Some think, resurrection is not important. 2. Results of the Resurrection: there are 4 things that happened as a result of the resurrection of Jesus from the grave. a. Death was conquered- 1 Corinthians 15:55- and we will be raised to life again as Christ has been raised from the dead. Verse 54 says that we do not have to fear death. b. The word of God has been validated. In the Old Testament, there are over 1000 prophecies about Jesus and they have been fulfilled. c. Jesus has been exalted to the highest place. Matt 28: 18-20. Jesus has all authority. d. The Holy Spirit has been poured out. In acts 2:33 it shows how Holy Spirit was the power with which the disciples are clothed. 3. Response: the big question- so what? a. Acts 2: 37- they were cut to the heart. They repented. And a sign of true repentance is water baptism and then being baptized in the Holy Spirit- this gives you a great assurance. Today is the day of opportunity. b. What shall we do now? Matt 28:18-20- go therefore, and make disciples of all nations. Reproduction is a normal outcome for a Christian. Following Jesus is not about the easy life. We should seek the kingdom first and all else will be added. The Apostles lived to proclaim the gospel- that was their focus. 1 Corinthians 5:14- For Christ’s love compels us- we should no longer live for ourselves. The response to the resurrection is repentance and reproduction and to glorify God in your life. 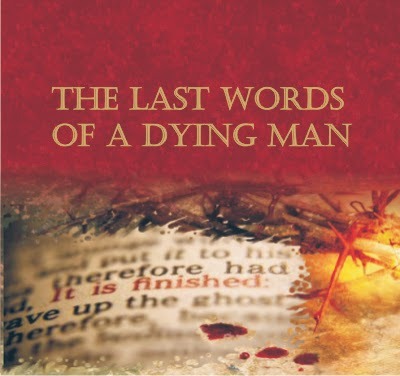 Traditionally today, people focus on the 7 last words of Christ. The four gospels phrase them differently. All 7 phrases are not in one gospel but it’s a compilation. Jesus was in great physical pain, he carried a heavy cross in the scorching sun and finally he was nailed to it. In moments like this, you don’t waste your words. Luke 3:34 (starting from verse 32) 2 other criminals were with him. 1. Jesus said, ‘Father, forgive them, for they do not know what they are doing. ’The first thing Jesus said was a prayer and gave forgiveness. As the blood flowed from his body, Jesus takes on the role of the high priest. He was in agony- but he did not lash out or curse them or call judgment on them. Jesus did the opposite, he prayed and interceded. Isaiah 53: 12- numbered with the sinners- what an amazing thing to do! Jesus did not come to condemn them. Did the people not know what they were doing? Pilate knew, the Sanhedrin knew, the 3 soldiers knew. What did they not know- that they were crucifying the Messiah- the Lord of Glory. How was that prayer answered- very quickly! The thief on the cross! Both had insulted Jesus but suddenly after Jesus prayed, one thief got saved. In Acts 2- a few days later 3000 people were added. Acts 3:6, a large number of priests God saved. That prayer is so powerful that it is effective even today. Even today he intercedes for us. This thief could do nothing – no church, no service to the poor, no tithing, no baptism- yet he received unconditional salvation. This is a testimony of grace. 2 Corinthians 5:21- God made him who had no sin to be sin for us, so that in him we might become the righteousness of God. 3. When Jesus saw his mother there, and the disciple whom he loved standing near by, he said to her, ‘Woman, here is your son,’ John 19:26 There were many friends of Jesus there and his mother. Can you imagine her agony? This reflects his tender love for his mother. John 19:26- Jesus did not call her ‘mother’. He always called her ‘woman’. Although she was his earthly mother- the relationship was of a sinner and a savior. She needed saving as much as anyone. Luke 11:27- Jesus rebuked people who elevated Mary. Jesus had brothers and sisters- Why did he not entrust his mother to them? Maybe because till then they did not believe. Acts 1: 14- but later they did. Jesus was showing that even in his agony he provided for his earthly mother how much more in his triumph and resurrection. 4. About three in the afternoon Jesus cried out in a loud voice, ‘Eli, Eli, lema sabachthani?’ (which means ‘My God, my God, why have you forsaken me?’Matt 27:46Psalm 21 and Luke 23- Right from the beginning the father and son were one and suddenly it comes to a halt and the Father turns his back on Jesus because he became sin. Jesus voluntarily took sin upon himself. This reassured that our sin has been paid for. 2 Corinthians 5:21 is a reality for us. 5. John 19:28- ‘I am thirsty’. That is an under-statement! They put some vinegar and give it to him. He had it to fulfill Psalm 21. We see the true humanity of Jesus. This debunks another myth that it was a spirit. We see his deity and humanity on the cross. In his final minutes he was displaying his power. It was a deliberate act of His sovereign will. His suffering was finished. The price was paid. You can’t add anything to the Cross. There are only 2 religions in the world. On says ‘do’ and the other says ‘done’! 7. Jesus called out with a loud voice, ‘Father, into your hands I commit my spirit. When he had said this, he breathed his last.Luke 23:46- Displays his submission to the Father. From creation to the cross, he was submitted. Jesus set us an example to follow in his footsteps. The eternal son became man and died a horrible death to take us to God. If you don’t know this assurance, put your faith in Jesus and acknowledge your sin, repent and follow. A miracle will happen like to the thief on the cross. And you can live for Him. For those of us who know- our response should be of immense gratitude for what Jesus did. We are called to follow him. Without the cross there is no glory and no crown. If the church life is easy, the question is, who are you following? Will we follow no matter what it costs? By the spirit, it is possible. This message was preached by Colin D cruz at Word of Grace Church Pune, on the 30th of March 2014 . You can listen/download to the audio by clicking here. As Christ followers we have been saved from hell and our sin. So now what? Is there some thing more to this Christian life? Is there an expectation of me? Am I supposed to do anything? Isn't this all about grace ? In India, we joke about the IST as Indian Stretchable Time. But there are many Indians who are disciplined and punctual. And in a recent business meeting I attended, there was an ‘on time draw’ where the people who were on time were rewarded. And I got the reward! It feels good to be rewarded, doesn’t it? Today, we look at a passage in Scripture which promises us rewards in this manner. This is a part of the Sermon on the Mount, which was addressed to the disciples. It lays foundation for what is expected of us as followers of Jesus. Firstly, remember that this is Jesus speaking and He is assuming something. He is assuming that His disciples will do ‘acts/ works of righteousness’. Q. 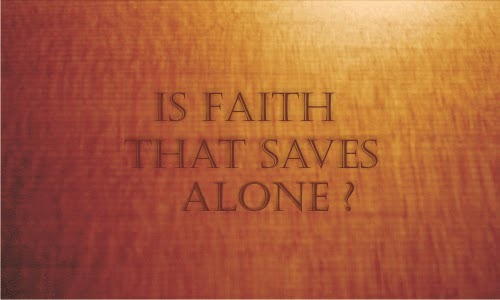 Now, why bring in works when we are saved by faith? The Christian faith is this- we are all sinners. We can’t take it away. So, Jesus died on the cross and paid for our sins and rose from the death. If we believe this in our heart and confess it with our tongue we are saved. Many Christians stop here. Its true that salvation is by faith and grace alone. But the faith that saves is never alone. There will be changes that prove this salvation. Justification is a legal term declaring that you are not guilty. You are accepted by God and Jesus’ righteousness is ours. 2 Corinthians 5:21- God made him who had no sin to be sin for us, so that in him we might become the righteousness of God. So, now the old self has been put to death and we are a new creation. With this new nature we put away sin and do acts of righteousness. We live as Christ followers. This is sanctification. When we come to Jesus, we get citizenship in heaven. We see our sinful nature and wonder, “I’m righteous?” Yes! Sanctification is when we become the righteous by practically working out our salvation. It’s a gradual process- slowly yet surely to become more and more like Jesus. Jesus says, if you do these acts of righteousness in the right way, you will be rewarded. He talks about 3 basic areas of discipleship. 1. Giving: there is a connection between your wallet and the heart. Your heart is determined by your giving. So please make it a practice that you are regularly giving into your local church. This is now your local church, not the one back in your home town. Secondly, don’t announce your giving for the praise of men. If we do not give with good motives, we can lose our reward. So examine your motives. You will be rewarded for your acts of righteousness even if no one knows about them. 2. Prayer: firstly, it’s not ‘if you pray’ but ‘when you pray’. Prayer is an important part of our Christian life. Sometimes, people make big showy prayers. Jesus says, go somewhere away from people and talk to your Father. He even goes on to model to us how to pray. So let’s look to our reward, not from men, but from our Father in heaven. 3. Fasting: when you fast – it’s not “if” but “when”. You are expected to fast. It needs to be a part of our lifestyle. So, when you fast, don’t look miserable and draw attention. Look cheerful and don’t draw attention to yourself. The Father wants to reward us. Why? As you pray, give faithfully and fast, you do acts of righteousness that will be rewarded by God. It’s not for praise and reward from men but from God. So let’s give generously, let’s pray fervently and lets fast and not let food be our idol. You don’t have to do a long fast. A day long fast is do-able. Imagine if the whole church did all these three things! How often should we fast? Not once a year on Good Friday but it should be a regular thing. It’s not a hunger strike but you also pray when you fast. Let’s take up the offer Jesus is giving us i.e When you do it and do it in the right way, the Father will reward us. Q. What are these rewards? They can take many forms. One of the main things is the Father’s commendation to hear him saying “well done”! I want to end with this verse - Revelation 22:12 says, ““Look, I am coming soon! My reward is with me, and I will give to each person according to what they have done.” Friends let’s do something because Jesus is coming with a reward. Labels: Christ likeness, Christian living, Church, devotion, discipleship, FAITH, Grace, Prayer, Spiritual disciplines.